I have been MIA for probably close to a month it feels like. I am not sure, I probably should’ve check my last post date. Either way. I have had a lot on my mind, changed jobs, and then had a huge fight in my family. Part of it had to do with my being vegan. Now if you have just started reading today, I am not vegan by choice. That is why I blog, so other beginner vegans can get through the hard part I didn’t know how to get through. The part where you want a cheeseburger and you don’t care about the damn animals. Well as you get deeper into being vegan a little part of you starts to care about the animals and then perhaps a big part of you (me) will eventually. I got sick. I had an organ removed. So I am forever vegan. Period. My brother and his wife do not embrace this lifestyle and that is totally fine and up to them. No matter what the animal rights people say I will not push my lifestyle on them. But I would like a little compassion. When I go out to eat, I have to be detailed and explain my dietary boundaries as a diabetic or gluten allergy person would. Explain what I can’t eat, what I can eat, and why so they understand I am not just being a pain for some new skinny diet. I really cannot eat that stuff and if I do there are major consequences. That being said, I do not go out a lot. I hate it, It’s hard, and stressful. Unfortunately, I have to (sometimes) for family events. During a recent family meeting my brother and his wife brought up how this makes them feel. To a very extreme degree. They deemed me annoying and impossible and that my discussion with the waiters was needless and ridiculous and too detailed. They do not seem to understand what happens when I get sick. Last year an ORGAN was removed. That is a pretty good reason in my book to take the time to explain in detail what I can’t ingest. However they do not agree and asked me to not do this and basically just order and hope for the best so they do not have to hear about it. My sister in law also went so far as to scream at me and repeat the comment that my food choices are “GROSS”. Well my darlings, this is where I must become less than pleasant. When you go out to order your food, remember…. it is not gross, your order is not annoying, and your reasons (whatever they are big or small) are valid. If your order takes twenty minutes and they need to bring out a short hand court reporter. Let them. You should not have any food forced on you. This leads to food issues. Either overeating, undereating, or resentment. Be happy, be healthy, and tell those folks to go away. I hate food nazis. I don’t want to be told to be vegan, be vegetarian, or be omnivore unless it is by a doctor who has a reason. If you have an Apple IPhone: Apps are my best friends! Try the following: Calorie Count (it tracks nutrients), VeganXpress (it tells you by restaurant what you can eat there), HappyCow (it helps you find restaurants that are veggie friendly! ), Specialty Produce (tells you what to do with those pesky unknown veggies you got in your CSA package), Dotti (also known as DWLZ.com, this helps you find out nutritional info for healthy choices), and Vegan Steven gives some great recipes too! Some places can tell you if there is hidden dairy. The Cheesecake Factory now has a lower calorie menu that includes a little milk symbol! Ask your waitress or waiter about ingredients if you couldn’t find it online. I go to the website of the restuarant before I leave the house. If it isn’t on there I then ask the wait staff. One restaurant brought the box of frozen veggie burgers out at a airport to let me read the ingredients. It was amazing how kind they were! Never back down. If they have the ingredients chances are they can make you something you can eat. Most places have veggies, pasta, rice, bread, and fruit. Ask for something simple like a pasta dish or rice sautee. They will accomodate you. 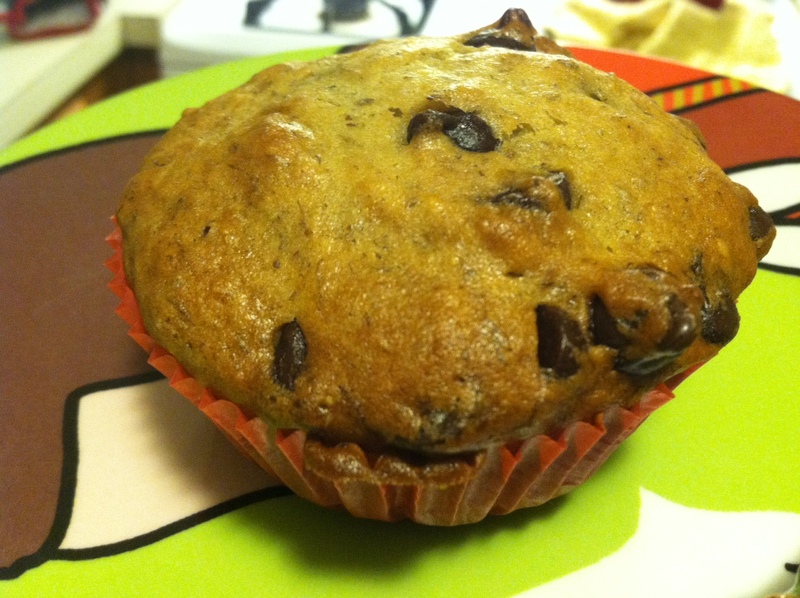 So I love muffins and chocolate and bananas and my “Joy of Vegan Baking” Cookbook so when I saw a recipe for Banana Walnut Chocolate Chip Muffins I passed out in a heavenly rush on my kitchen floor! All jokes aside the recipe was easy and yummy and hit the spot. I could make a ton of them for a work related early morning meeting or just to snack away at throughout the week for the whole family. I even brought some to my neighbor’s house last night for the kids and they became the “best muffin I ever ate” by the 8year old omnivore at the house. So that being said, I knew I had to throw the adapted recipe up. 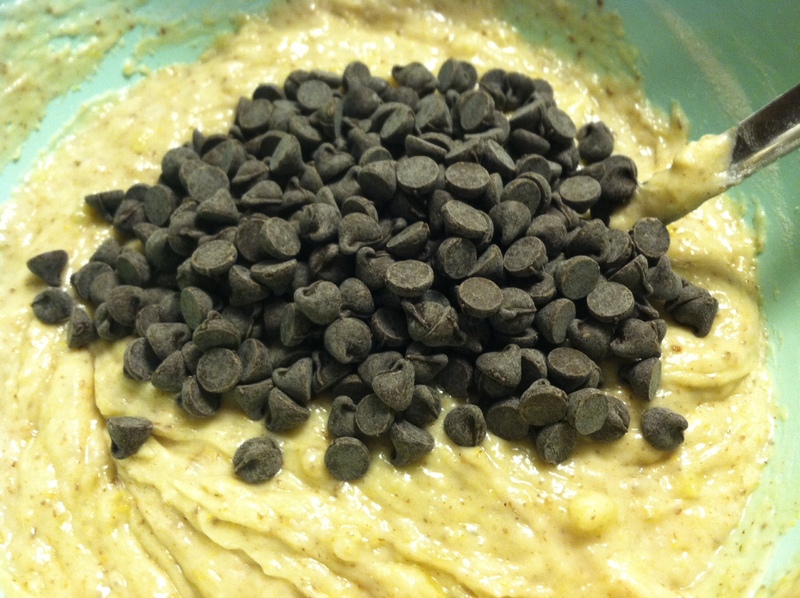 The “Joy of Vegan Baking” calls for more chocolate chips which I am usually game for but in this case they were crumbling apart from the chips so I cut them in half and it was perfect. 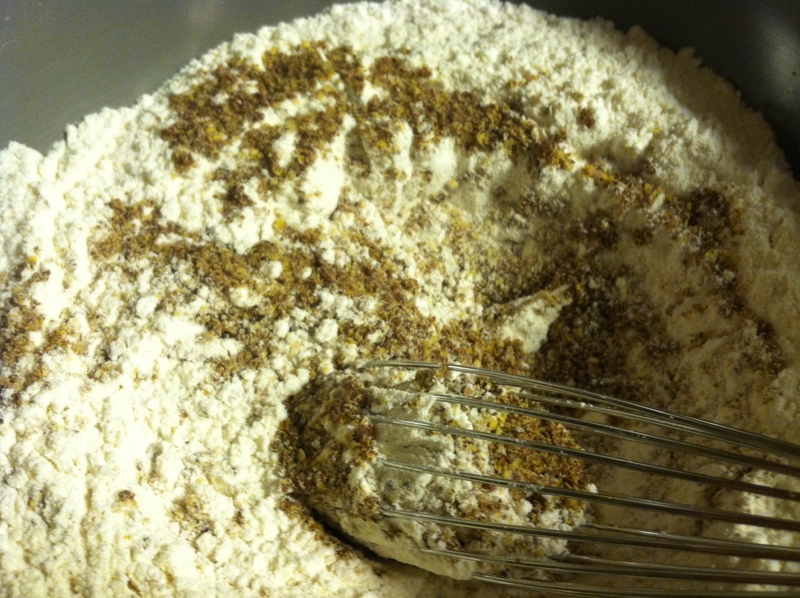 I also added a little more vanilla and some flaxseed powder. 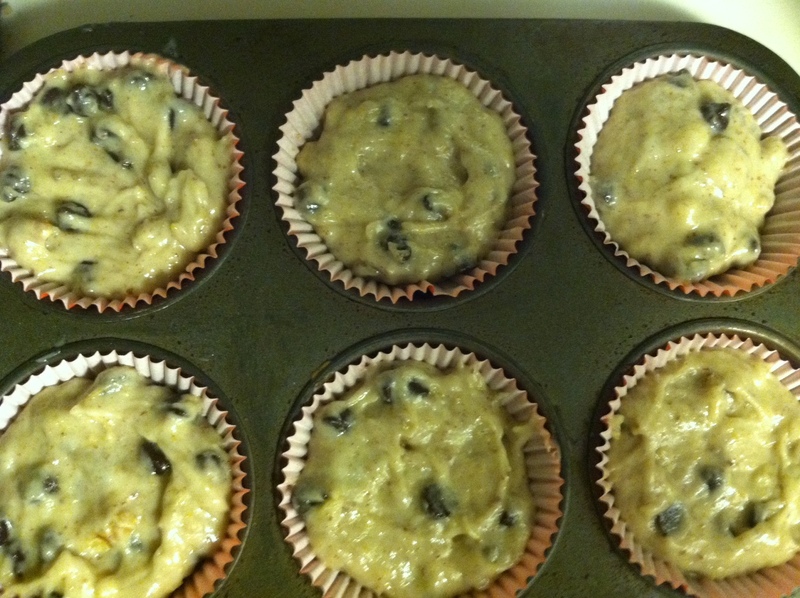 The muffins keep well and are pretty good ingredient wise with nuts, seeds, and 4 bananas. Can’t beat a semi-healthy muffin! Enjoy! OPTIONAL: Add 2 tbsp powdered flaxseed for a little extra goodness, it won’t effect the flavor or texture! 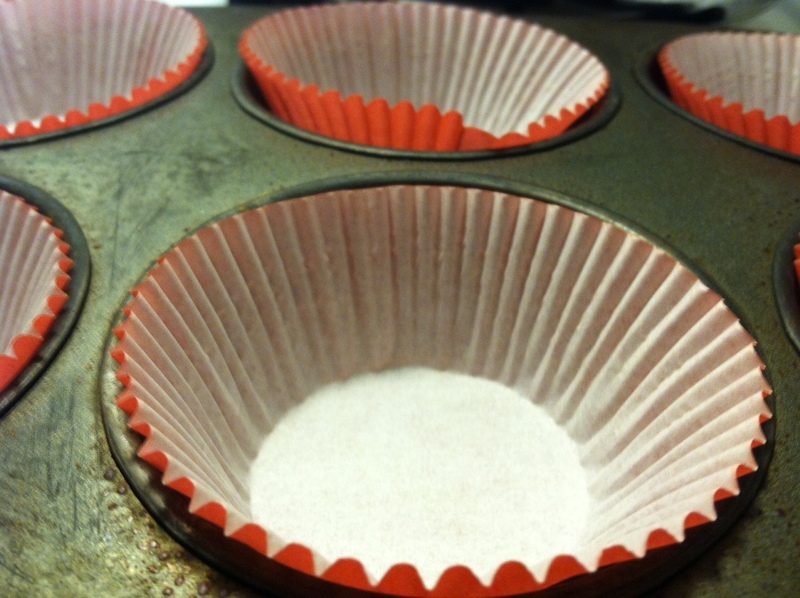 Place paper in muffin tins. You can use folded parchment or just any good old cupcake paper wrapper. I have tons of old Christmas ones so red and green it is! Get two bowls to mix in. One for wet ingredients one for dry. 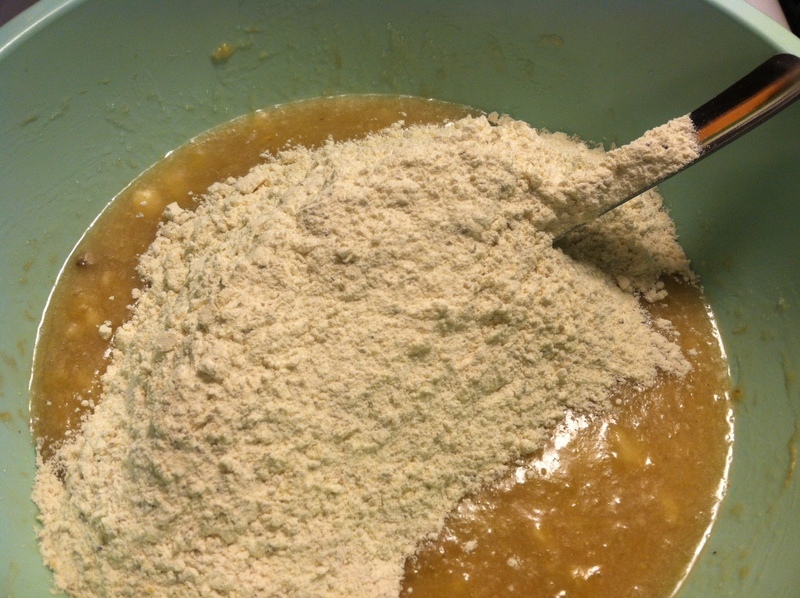 The larger one for the wet ingredients as you will add the dry to this mixture later. 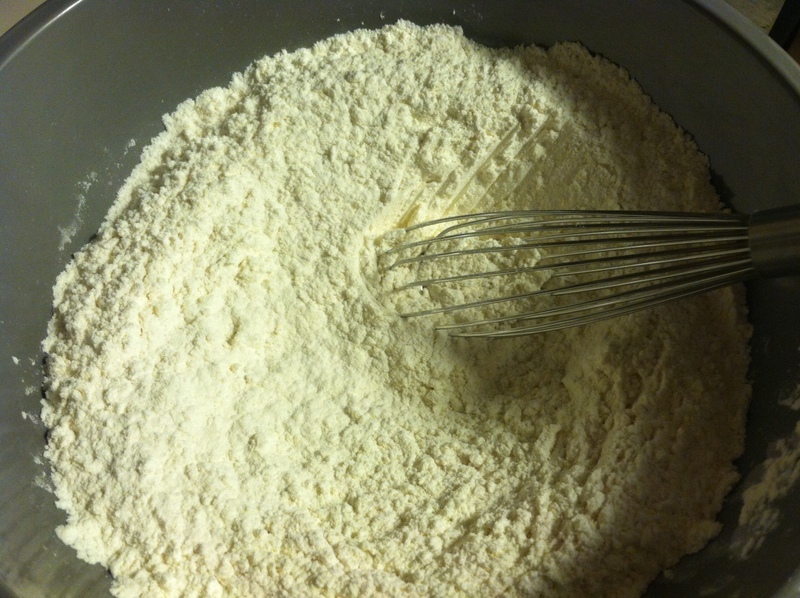 Flour, Baking Soda, and Salt in on bowl (optional flaxseed powder). Lightly whisk to combine everything well. 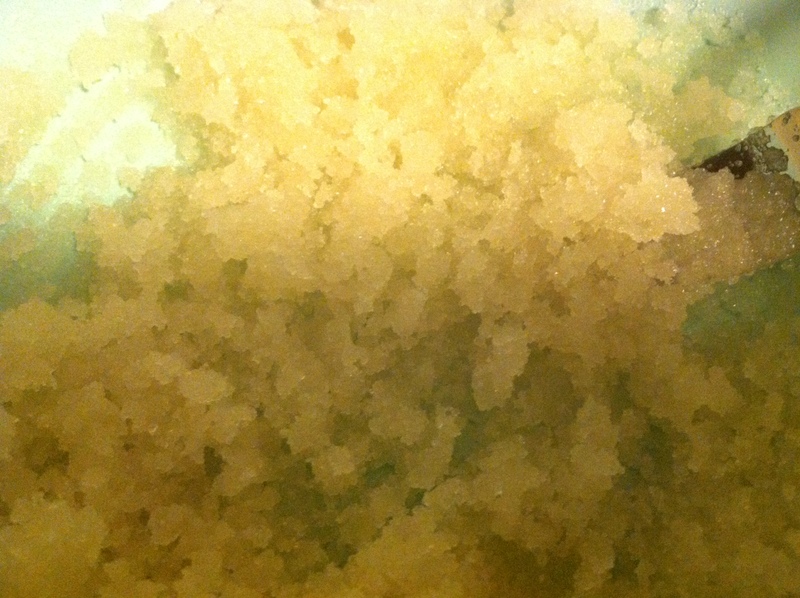 Next, in the larger bowl or the “wet” bowl mix the oil and sugar until it looks like a yellow slushy. 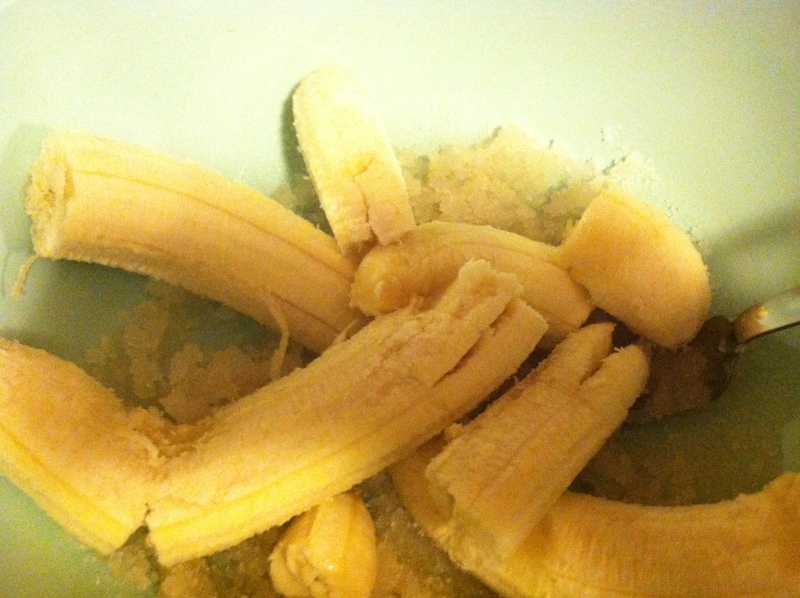 Mash in the bananas to the “slushy” mix. Then add water and vanilla. Combine well. 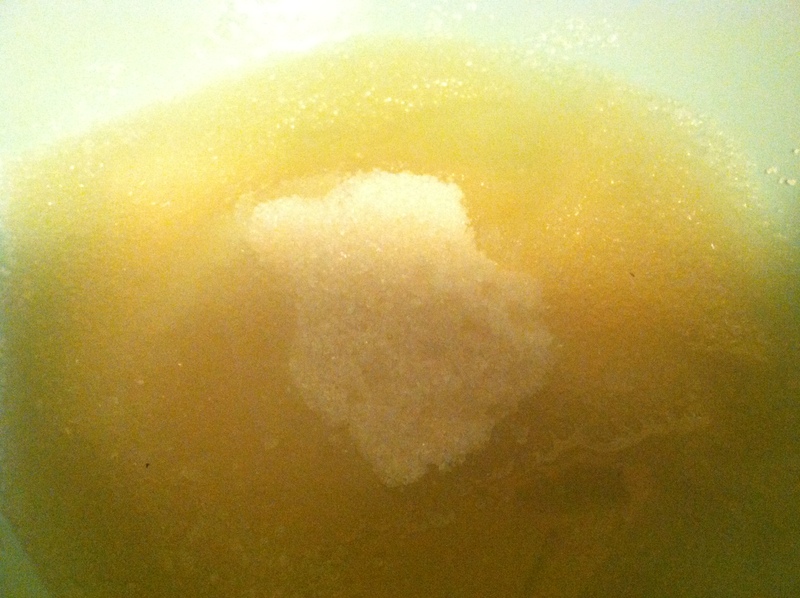 Now sift the dry mix into the wet mix slowly. 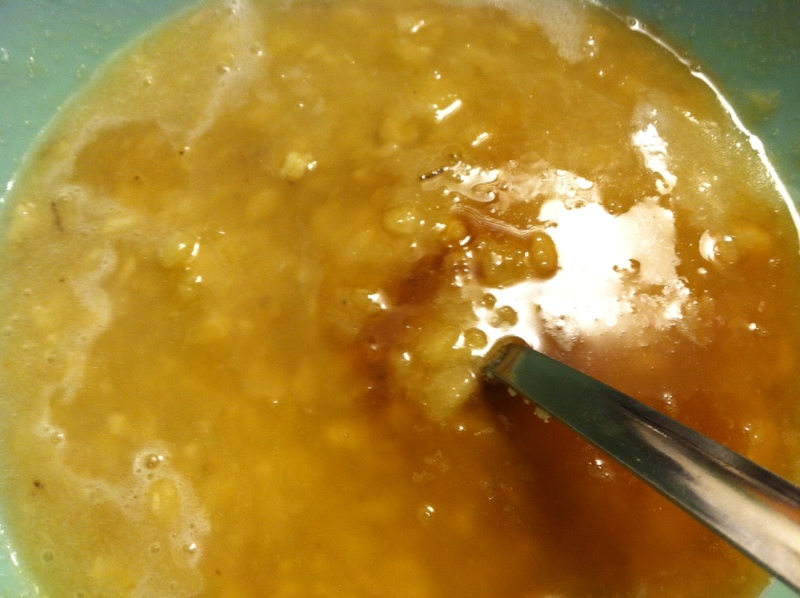 I would add about 1/8 at a time then stir in completely and sift in the next bunch to avoid those bubbles of lumpy dry mixture. 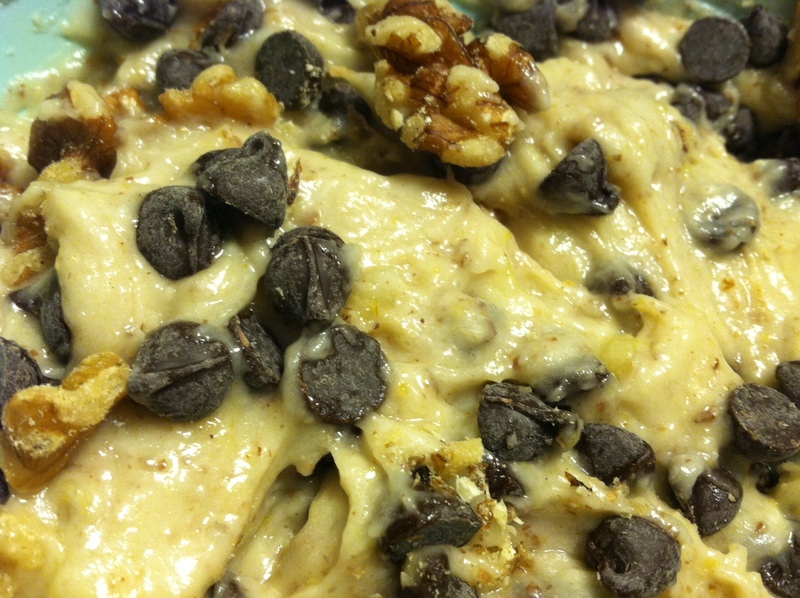 Once all is combined well stir in chocolate chips and walnuts. Scoop mixture into cupcake pan/cups. I use a 1/4 cup measuring cup if my Ice cream scoop is unavailable. Back for 25minutes in a gas oven it may take closer to 30 in an electric oven. Take out, cool, and eat.